We boarded the West Jet plane that was the beginning of our long journey from Sasktoon to Vancouver to Mexico City to Puerto Vallarta. The flights weren’t great but using Air Miles the price was right. We had printed all our boarding passes and the luggage tag for our one suitcase. We were assured the bag was checked through to Mexico City where we would pick it up at Customs. We spent the day with our daughter in Vancouver, searching for maple leaves for little Lucio who had requested them and then headed back to the airport for our overnight flight to Mexico City. That is when I realized I had lost my boarding passes. No big deal right? They’ll print me more right? First we tried the West Jet desk in the Domestic arrivals area where we had first landed. No, since the West Jet leg is finished, you need to go to the Aeromexico desk in the International Departures area. We headed to Aeromexico and explained our dilemna. Yes they could print me new boarding passes – no problem. But Senora, where is your luggage tag that is usually attached to the boarding pass? Well yes that is lost too but I’m not worried – I’m sure the luggage won’t be lost. But Senora, you can’t board the plane without the luggage tag – they have to look at it at the gate. And you won’t be able to get your suitcase in Mexico City without that tag. Okay I have traveled a LOT and no one has ever asked to see the bag sticker – except that time in Ottawa when I lost my bag and filled out all the forms and then realized the bag was sitting right beside me all the time – but that’s another long story. Certainly no one has ever asked to see my sticker BEFORE letting me board the plane! So I pushed back a bit. That doesn’t really sound right. 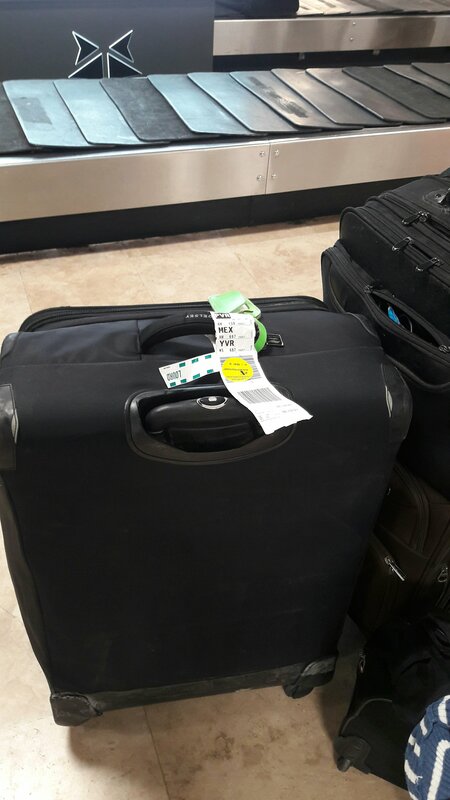 My bags were checked in Saskatoon all the way to Mexico City. Why would the gate agent in Vancouver need to see my bag receipt before letting me board? Senora, they need to prove it is your bag. But it’s already been proven – in Saskatoon where it was loaded. Well they won’t put it on this plane until we see your sticker. So you mean all of these people in this line are going to show you their bag tag? Yes Senora. Can I double check this with your supervisor? Who said this was certainly the case – no luggage tag, no boarding. Okay well can’t you just print me another bag tag along with the boarding passes? No Senora, only West Jet can do that. I can see the record of your suitcase on my computer so let me write the number down on your new boarding pass and you go to the West Jet desk and tell them you need another tag with this number. It is not far. So off we went to find the West Jet desk – which was definitely far. We were in the International Terminal – West Jet is at the far end of the Domestic terminal. Of course when we got there they said what I expected them to say. What? That makes no sense. I can’t print the bag tag since the flight is in progress. But I’ve never heard of anyone ever checking the tag at the gate. That’s total crap (quote). But let me get my supervisor. Who raised his eyebrows very high and said, Well that makes no sense. I’ve never heard of that. Are you sure that’s what they said? Sigh. Just like getting our trailer license plates all over. The kind agent tried to help. Okay well here is my computer screen which shows your luggage number – why don’t you take a picture on your phone of my computer and show it to them. Which I did. But the thing is, it was the same computer screen the Aeromexico lady had already shown me when she was writing down the number to show West Jet. We headed back to the Aeromexico line, found the supervisor and showed her the photo on my photo – WHICH WAS ALSO ON HER COMPUTER – and she said that was fine, just show it to the agent at the gate. We wandered around a bit – decided that it was not worth $34.95 to bring a tiny box of maple chocolates home to the children at the orphanage – and then headed to our gate. Where the exact same lady we had been arguing with in the ticketing line was now the gate agent. I walked up to the gate and handed her my boarding pass. Oh yes Senora Swanson, we were just paging you. We need to verify your bag tag. I rolled my eyes and pointed to the spot where she had written our bag tag number. She punched away on her computer. Oh yes, I can verify this is the correct number of your bag tag. WELL NO KIDDING – YOU JUST WROTE IT THERE after looking it up 30 minutes ago. I never did show anyone the picture on the phone. And as expected, no one in Mexico City asked to see my bag tag. They didn’t even ask the standard questions like did I have alcohol or cigarettes or $10,000 or maple leaves from Stanley Park which I may or may not have had. This entry was posted in Challenges & Frustrations, Our Life Here, Traveling in Mexico, Uncategorized. Bookmark the permalink.